Information systems are at the heart of virtually every business interaction, process, and decision, especially given the vast penetration of the Web in the last few years. Like previous editions, this fourth edition of Managing and Using Information Systems by Pearlson and Saunders gives you the foundation to become a knowledgeable participant in information systems decisions and to manage information for competitive advantage. In a departure from earlier editions, this new edition includes ideas that impact the new generation of “digital natives” — managers who are at home in the digital world and expect to leverage in their business lives the technologies they depend on for social interation, collaboration, and innovation. 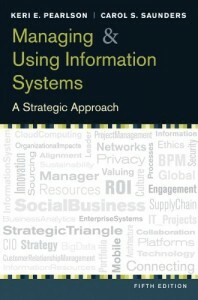 Brief, yet complete, this text provides a basic framework for understanding the relationships among business strategy, information systems, and organizational strategies. You’ll learn how IT relates to organizational design and business strategy. Most of all you’ll develop the skill to recognize opportunities in the work environment and to apply what you know in innovative ways. Whether you’re coming from IS or the business management suite, Managing and Using Information Systems, Fourth Edition will give you a valuable grasp of how technologies affect business decisions, so you can grab every opportunity for business success. In the rapidly emerging, global digital business environment, the speed of change will be limited only by the laws of physics. What kind of organizations will thrive in such a world? According to the Theory of Relativity, time stands still for an object traveling at the speed of light. Therefore, viable companies in the near future will be those that achieve the calm — the zero time — at the eye of the storm of change, by learning to move a lightspeed. These “Zero Time” companies will react to change before it happens and provide value for every customer at every opportunity. They will recognize and satisfy customer needs before they are articulated. They will identify future markets, often years before they actually emerge, and rapidly acquire the competencies needed to capture those markets. And they will zero in on valued customers and act quickly to forge lifelong partnerships with them. While all this may sound like science fiction, it is very close to becoming business fact. As you will discover in the pages of this groundbreaking book, many of today’s most successful corporations already possess Zero Time capabilities, and it is only a matter of a few years before the fully-evolved Zero Time companies appear on the scene. Once they do, those companies who cannot or will not take the evolutionary leap into Zero Time will become extinct.